Large state or small state, the success of health information exchanges hinges on the same factors. Much has changed in the decade since the HITECH Act and meaningful use ratcheted up interest in health information exchange (HIE). The overall space has matured and consolidated, jettisoning those HIEs that weren't evolving with the times and rewarding those that remained with expanded opportunities to generate real value for their stakeholders. "HIE isn't just the movement of data anymore. It's a logical, consolidated record, alerting, population analytics, and decision support tools," says Robert M. Cothren, PhD, chief technology officer of the National Association for Trusted Exchange, a membership association focused on enabling trusted exchange among organizations and individuals with differing regulatory environments and exchange preferences. "It's also become a more collaborative environment. HIEs are borrowing from each other, especially regional exchanges. They don't see themselves as competing but rather addressing the needs of the community." Over the years a common set of characteristics has emerged that are shared by the most successful HIEs, including a focus on enabling a longitudinal community record and a mastery of patient identity management. "As they climb the value chain, successful HIEs enable public health reporting and alerting, which helps enable alternative payment models and [provide] a class of higher-value services directed at reducing the information burden on doctors," says Cothren, who also serves as executive director of the California Association of Health Information Exchanges. He adds that the maturation of the market has brought about competing technologies that threaten some initiatives. "Technologies that focus on retrieving and showing the record of what one provider saw at his or her hospital are useful tools. But successful HIEs need to do more than that," Cothren says. To illustrate how the evolution of the HIE sector has played out, For The Record profiles two initiatives: the Colorado Regional Health Information Exchange and the Rhode Island Quality Initiative (RIQI). These organizations demonstrate how, regardless of the size of the state, the factors driving success remain largely the same. "What changes," Cothren says, "is the size of the community. The expectations are the same." "We drew up a plan for sustainability with payers, providers, and hospital systems as our major supporters, as well as philanthropy and government," he says. "We tried to get everyone around the table in a completely transparent setting to the point of actually asking hospitals who [among them] would be willing to pay and letting the subscribers drive the subscription model to make it work." That flexibility and willingness to collaborate out of the gate was when CORHIO's "foundation for success really started. We believe we are uniquely collaborative in Colorado. We brought folks to the table we knew would need to support our efforts on both the functionality and business sides," Honea says, adding that it also required strong governance and data use policies to avoid conflicts and protect the information flowing across the HIE. It has worked. In 2009, the state of Colorado designated CORHIO as its state-designated entity, which paved the way for securing several grants focused on building capacity for statewide HIE. These included HITECH funding and funding from The Colorado Foundation, without which "we would be in a very different place," Honea says. Today, the self-sustaining organization manages one of the country's largest and most successful HIE networks with more than 10,000 users from more than 1,100 organizations and connections to 61 hospitals and several labs and imaging centers. CORHIO exchanges 375,000 clinical messages each day and receives 250,000 queries of patient data each week. Data are delivered across an infrastructure and platform provided in part in collaboration with Medicity. Operating on a subscription model with fees varying by customer type and several other factors, CORHIO delivers to participants HIE technology and tools that provide real-time comprehensive clinical data directly in their EHRs or via a secure web portal, as well as notifications. Its network includes hospitals, labs, radiology centers, physician practices, health clinics, long term and postacute care facilities, behavioral health providers, and emergency services to which it provides data routing, emergency patient lookup, patient event notifications, public health reporting, care transitions, direct messaging, and newborn screening results. CORHIO also provides advisory services to physician offices on the effective use of technology to improve care delivery, such as EHR adoption, meaningful use attestation, and quality reporting. Additionally, CORHIO supplies health plans and accountable care organizations with data to enhance analytics and population health programs. "We've developed a very mission-oriented collaborative culture, which helps with a lot of the discussions about how to make health care better," Honea says. "We are one small component of some really big challenges. We're not going to fix them individually, but we recognize that we're not all things to all people. We can't get in our own way. We can't try to do everything. We recognize the space we occupy and try to bring others around to partner and do new and exciting things. That is probably our biggest success." Much of the success on the infrastructure side can be attributed to CORHIO's foresight in developing a transformation support services staff to assist provider organizations wanting to connect with the HIE, as well as guidance on how to utilize that technology to their best advantage. Doing so has not only helped smooth the traditionally bumpy road to clinical workflow integration but also helped CORHIO identify and address needs early on. "We have really great synergies between the two dichotomies of organizations, with experts on both the information exchange side and out in the field supporting transformation. They understand HIE inside out and can help providers incorporate HIE into their workflow, guide them on how to meet the measures of multiple incentive programs, and indicate where CORHIO can provide additional support with other challenges," Honea says. Nonetheless, CORHIO recognized early on that how effectively it managed data and access would determine its long-term fate. Thus, it has gone the extra mile to ensure data integrity. This includes a quality assurance team tasked with maintaining the integrity of the information as it flows through the network, focusing on everything from normalizing data to preventing message backlogs. "Data are very finicky. There are a lot of data and a tremendous amount of noise," Honea says, adding that CORHIO is looking at ways to expand the information available to subscribers to include new sources of data such as prescription drugs and social determinants of health. "As you talk about adding data to that stream, the science of implementation becomes all the more important. … We continue to add functionality, growth, breadth, and depth, so we are constantly talking about expanding access via FHIR [Fast Healthcare Interoperability Resources], which is crucial." Honea notes that technology in the HIE space is not advancing as quickly as it needs to be, adding that the approach of building highly customized interfaces will, at some point, become obsolete. "Application programming interfaces, FHIR, and other emerging technologies are going to change the way we look at and approach interoperability. We won't replace what we've already built, but if we can transition to other technology types that lower the cost and time of implementation and create better data standards, that's where I think we have to have our eyes," he says. Honea believes CORHIO can be a vehicle for fixing what's wrong with health care in Colorado, providing the state's residents with "a unique advantage when it comes to their health and health care simply by getting their health care here. "We want to be active participants in the state planning process for what we want health and health care to look like in Colorado," he says. "There are tremendous opportunities to be part of that vision. I'm talking about patient empowerment and really starting to make the correlations and connections between health and health care, and how we can play a role in that improvement." Not to be outdone by its large-state counterparts, RIQI is recognized as one of the most successful and innovative initiatives in the nation. RIQI owns and operates CurrentCare, a secure electronic network that integrates a wide range of patient information, including laboratory results, medication histories, and care coordination data. The HIE allows providers to access real-time comprehensive patient information and provides patients with access to their comprehensive health information via a PHR known as CurrentCare for Me. CurrentCare has more than 550 enrollment partners, and nearly one-half of all the state's residents have enrolled. 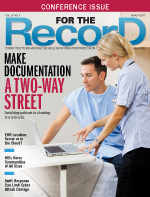 Its nearly 500 data sources include all the state's acute care hospitals and the VA hospital, as well as physician practices, community health centers, urgent care and imaging centers, labs, skilled nursing facilities, pharmacies, and pharmacy benefits managers, which together post more than 40 million transactions annually to CurrentCare patient records. Also crossing the exchange are 90% of all prescription histories from the state's retail pharmacies and 90% of lab results generated in the state. RIQI is the brainchild of Sen Sheldon Whitehouse (D-RI), who founded the organization in 2001 while serving as Rhode Island's attorney general. When he first assembled the group of top executives from every constituency of health care, Whitehouse had three requirements: There would be open collaboration, that collaboration would produce real results in terms of moving health care metrics, and it would be led by the highest-ranking executives of stakeholder organizations. "No lieutenants," says RIQI President and CEO Laura Adams of Whitehouse's dictate. "Don't send your lieutenants in your place. You can bring anyone you want with you, but not as a substitute for you. Sixteen years later, our board remains populated by the highest-level leaders. … What Senator Whitehouse did was incredibly perceptive but also practical." Having that kind of power at the table helped accelerate commitment and decisionmaking. More importantly, it ensured immediate adoption of the HIE's "primary guiding principle: keeping the patient as the North Star," Adams says. This philosophy allows RIQI to set its sights on identifying a technology-focused resolution to some of health care's most intractable data-related problems without the conflict that plagued many early efforts. For example, reducing duplicate tests would reduce costs and increase safety but would also require some provider organizations to take a direct financial hit. Hospitals "had to be willing to incur revenue losses from such things as testing and readmissions to form this HIE," Adams says. "That wouldn't make sense to everyone, but to our organization and collaborators it did. It worked because everything was framed as 'what is in the best interest of the patient.'" It was this rock-solid stakeholder foundation, coupled with a grant from the Rhode Island Foundation, that enabled RIQI to partner with Surescripts in 2002 to launch the nation's first pilot of end-to-end ePrescribing. It was the first in a series of early wins that set the stage for RIQI to grow into the tiny powerhouse it is today—including its distinction as the only organization in the nation to win all three major ARRA grants totaling $27 million. Despite receiving "first dollar, last dollar, and all the dollars in between that we applied for," Adams says long-term sustainability was a challenge. Grants are the gifts that keep on taking, in that what is built with that funding must be sustained and scaled, she says. To overcome this barrier, RIQI leveraged a $2.5 million contribution from CVS Foundation to engage Boston Consulting Group to prepare a business case that projected a return of approximately $100 million on an $8 million spend when the HIE was finally built out—a benefit that would be shared by everyone involved. "That's when we started thinking about how to fund [the initiative] as a public utility with a broad-based sustainability plan where everyone pays a little but benefits significantly," Adams says. For example, the State Executive Office of Health and Human Services stepped up as the first entity to pay $1 per member per month (PMPM) to enable a flow of funding from Rhode Island and also enable a 90/10 federal match of those dollars. Immediately thereafter, every health plan in the state joined in paying $1 PMPM for their insured book of business and also as a self-funded employer, as did hospitals, the State of Rhode Island as an employer, and the state's largest self-funded employers. Adams also gives credit to the state government, which "has been unbelievably collaborative and visionary." A prime example took place in 2013 when Rhode Island became the first state in the nation to enable the flow of substance abuse and alcohol treatment protected health data into the HIE. This achievement was enabled by the creation of a strong privacy and security framework, up to and including the passing of new laws by the Rhode Island legislature. "All of these people put their shoulder to the wheel and made things happen," Adams says. RIQI's approach to technology is equally important to its long-term success. One example is the recent launch of the Health Care Coordination for Rhode Island Veterans project, which enables bidirectional sharing of information through the integration of VA clinical information and CurrentCare. The partnership allows providers at the Providence VA Medical Center to view veterans' information from CurrentCare—medication histories, test results, hospitals, and emergency encounters along with details on care received at more than 475 community-based care organizations—while community providers have access to a more thorough history of their own patients who also receive care at the VA.
"This closes a long-standing gap in Rhode Island. From a data access standpoint, that's important," says Colin Fletcher, RIQI's director of HIE. It's unlikely that the VA would be willing to open access to its patient information had RIQI not laid a solid foundation of privacy and security to ensure the integrity of the data flowing through its HIE. Fletcher points to the organization's robust policies and procedures, which are publicly available on the CurrentCare website. But it's not just RIQI's privacy and security protection that stands out. It's also the continuing focus on improving the provider and patient experience. It is one reason the HIE is planning to adopt FHIR, and why it worked with Integra Community Care Network to launch Care Management Alerts and Dashboards, which enables providers to proactively coordinate care and support for 140,000 individuals throughout Rhode Island. This newest service is near-real-time notification of any provider in the state when his or her patient is admitted to or discharged from a hospital or emergency department in the state. This alerting service allows immediate engagement in patients' care by their primary care team or specialist involved in their care and more effective management of chronic illness. "It's the ability to allow the person to ask a specific question of the data," Fletcher says. "Right now you can ask for data ranges, but with FHIR you can drill down to the next level of detail and get down to specifics. It puts control of what data the person or organization can access into the [requester's] hands rather than making them interpret" what the system returns. Adams views this as a critical next step for RIQI, one that will enable closer integration into the clinical workflow and easier access for patients to their own data in CurrentCare. "We keep raking in tons of clinical data into CurrentCare, and one doctor told me, 'Your heart's in the right place, but I'm looking for a needle in a haystack, and you keep piling on more hay,'" she says. "We need to get better at delivering systems that integrate directly into the workflow … so they never have to dive into the morass, searching through the haystack."